John L. Martin is Research Director of the Center for Immigration Studies. He has recently authored "Immigration-Related Statistics, 1993" and Four Hundred Million Americans! His research articles have appeared in the Statistical Abstract of Latin America. "...the fact [is] that our borders leak like a sieve: those things cannot be permitted to continue in good conscience." "I don't think that the economy can absorb a massive flow of immigration that does not relate to the issue of persecution." "Our asylum system is sick." President Bill Clinton announced on July 27, 1993 an immigration reform package that includes changes to the current Immigration and Nationality Act and increased funding for border control operations. The initiative is designed to restrict abuse of the asylum provisions of the law, smuggling of aliens into the United States and other illegal entry. The nature of the reform proposals developed by a task force chaired by Vice President Al Gore was first outlined by President Clinton on June 18, when he announced the nomination of Doris Meissner as Commissioner of the Immigration and Naturalization Service (INS). Prospects for enactment of these or similar measures are favorable, despite the opposition of immigrant rights groups, because there is also active support for reform efforts in the Congress. 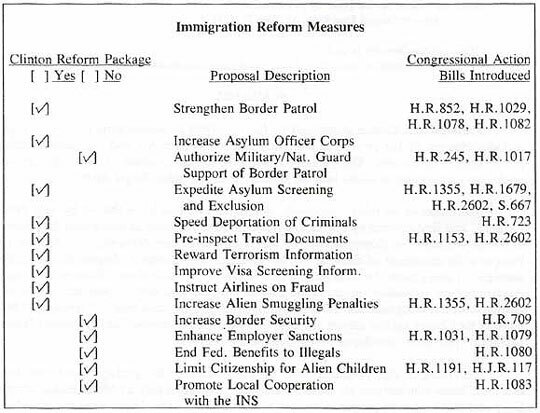 Asylum reform legislation similar to the Clinton proposal had already been introduced in both chambers of the Congress, and several hearings had already been held. It remains to be seen whether the Clinton asylum reform proposal for "expedited exclusion," or the tougher "summary exclusion" provisions developed in the Congress will prevail. According to Vice President Gore, the introduction of this package of reforms does not end the Clinton administration’s focus on the issue. During a July 27 White House ceremony, Gore said that long-term proposals are yet to be examined. The details were not revealed. but it would seem likely that, among other things, in closing up the political asylum loophole the administration would want to reverse the Bush administration's Executive Order that established a blanket policy of providing favorable asylum consideration to Chinese who claim fear of persecution under China's one child per couple population policy. There remain areas of immigration reform not addressed in the Clinton reform package. This fact was quickly pointed out by Republican advocates of immigration reform, who labeled the Clinton package a "two percent" solution. Rep. Lamar Smith, chairman of the House Republican task force on illegal immigration, coined this term, stating that the reform measures " ...address only 2 percent of the illegal entrants a year. " Members of Congress have introduced numerous immigration reform initiatives that were not included in the administration's approach. One major area not addressed is the need to tighten the employer sanctions provisions of the Immigration Reform and Control Act (IRCA) to reduce the attractiveness of the United States as the "land of opportunity" to would-be illegal aliens. Legislation has already been introduced in the House to address this problem, and a Senate version is being readied. The Clinton proposals, if enacted, may decrease asylum abuse and illegal entry by tens of thousands, but illegal immigration is likely still to be a problem with a magnitude of hundreds of thousands. Another significant area left unaddressed by both the administration and by Congress is the broad question of the level of legal immigration — over 800,000 last year. No focus has yet been cast on whether the increases in legal immigration legislated in 1990 should be reversed, and how legal immigration should be related to the long-term interests of the United States. "The simple fact is that we must not — and we will not — surrender our borders to those who wish to exploit our history of compassion and justice." On July 27, President Clinton unveiled at a White House ceremony the immigration reform package he had earlier foreshadowed when he announced the nomination of INS Commissioner on June 18. Also participating in the announcement were the other chief administration actors on this issue, Vice President Gore, who chaired the inter-agency task force charged with developing the administration's proposal, and Attorney General Reno, who has said that control over illegal immigration is a principal challenge for the Department of Justice. Also present were important Congressional leaders and Doris Meissner, the INS Commissioner-delegate. The reform initiative includes several components requiring congressional action. The principal provisions are a series of amendments to the Immigration and Naturalization Act (INA) that deal with smuggling and asylum abuse, and increased funding for border enforcement and inter-agency cooperation. The price tag on the reforms is $172.5 million in addition to the previously requested budget levels. "All the asylum laws are a joke. We all know that. Its not just the sheikh, that just made it dramatic. You come in, you say asylum, they say 'OK'. It'll take us a year to figure out whether or not you're telling us the truth. Meanwhile, go down...and get yourself a job. They disappear. It is a joke. That has to be changed. " The key initiative in the proposals is legislation to reform the asylum system. The administration was slower to act in this area than the Congress. Already three pieces of legislation have been introduced in the House, hearings have been held and a revised bill has been presented that incorporates features of the earlier three bills. On the Senate side asylum legislation was also introduced and hearings were held. However, none of these measures has been adopted in subcommittee, let alone at the committee level, so the administration proposal, may still be incorporated into the legislative drafting process. The administration's initiative is based in part on the legislation already shaped in the Congress, especially in the Senate, under the sponsorship of Senator Alan Simpson. The thrust of the legislation would be to substitute the current multi-layered administrative and judicial review process for persons who claim political asylum protection with a two-stage process that eliminates judicial review for persons who have not yet been admitted to the United States. The Clinton reform proposal is intended to deal with asylum abuse by screening asylum claimants at the ports of entry on the same day as they apply, or at most within a few days. At present the number of aliens who arrive at airports and present fraudulent entry documents or no documents at all and then request admission as asylees is about 15,000 per year. Most of these arrive at JFK airport in New York City, where such cases reach almost one thousand per month. In addition to these airport cases, additional thousands of illegal aliens are found by the INS to be illegally in the United States and then assert political asylum as a defense against deportation. A third category of asylum applicants are those who initially enter the country legally as non-immigrants and later file an asylum application with the INS alleging that they have a well-founded fear of persecution if they return home. The upsurge in the number of asylum applicants in recent years to between 50 and 100 thousand annually has swamped the asylum processing system, has vastly exceeded the available INS detention facilities, and has resulted in the release on parole status of most of these asylum applicants. At present, those who are paroled into the country are granted legal permission to seek employment. However, this work authorization is discretionary , and the INS indicated in a July 29 statement that among the steps being considered for implementing the reform package is a denial of work authorization until such time as a favorable decision is made on asylum status. Parole status is the loophole that has attracted the increasing numbers of claimants. With the asylum first review stage taking up to eighteen months, the INS has found that as many as eighty percent of the asylum claimants would not show up for the hearings on their status. Those immigrants forfeit the chance to gain legal resident status, perhaps because they had no confidence that the decision will be favorable in their case, and because they, in the meantime, have established themselves in this country, albeit illegally. Another component of the legislative approach would extend the provisions of the anti-racketeering crime sanctions to the smuggling of aliens. These provisions include confiscation of assets, longer sentences, and authorization of wiretaps. The measures intended to strengthen exclusion of undesirable aliens include an expansion of the current pilot system of pre-inspection at foreign airports of travelers to the United States. Similar legislation (H.R.1153) was previously introduced in the House by Representative Charles Schumer (D-NY). His proposal would expand the current pre-inspection pilot program to at least an additional three ports of embarkation, depending upon the source of the greatest volume of fraudulent entry over the past year . Current weaknesses in the visa documentation system that are largely equipment related are to be corrected by the Department of State. Some of the request is for expanding the capability to issue computer-readable visas. Another provision would increase communication capabilities to extend the electronic database that identifies persons on the "lookout" list to most remaining visa issuing posts that do not now have computer access to this information. Also sought are resources for improved State Department, INS, and intelligence community information sharing. The $172.5 million price tag on the administration's reform package also requires Congressional action. Part of the funding requirement is additional to the FY'94 budget currently pending in Congress. About $45 million would go to the Department of State for better control of visa issuance, and the balance would be for INS enforcement efforts over the next two fiscal years. This is about eight percent above the current $1.6 billion budget request for the INS. Funding in the amount of $45.1 million will be sought to provide for up to 600 additional Border Patrol agents and supporting equipment. An additional $62.5 million is being requested to double the size of the asylum corps within the INS and the INS officers who interview criminal aliens for the purpose of deporting them upon release. The asylum officers are projected to number 300 by the middle of FY'94. This request is designed both to tackle the backlog of over a quarter of a million pending asylum cases and to provide the resources for implementing the new expedited exclusion provisions proposed in the INA amendments. A further $12.7 million is requested for expanding the system of pre-inspection of travelers to the United States at certain foreign airports. Finally, the request also seeks $5 million for a fund to reward informants for leads on terrorist plotting. About half of the additional funding request would be covered by new user fees and the rest from general funds. The administration proposed to raise $25.5 million by increasing INS inspection fees from $5 to $6 and by instituting fees on cruise ship passengers. A further $9.5 million would be raised from increased INS application fees for such services as adjustment of immigration status. The State Department will seek authorization to place a surcharge on computer-readable visa applications, thereby raising a further $45 million a year. In addition to these sources of funding and a couple of other minor ones, the administration will seek a supplemental appropriation of general funds for the remaining $85.5 million. The administration's announcement clearly shifts the public's focus to the Congress for action on reform of abuse of the nation' s immigration law. Few will remember that the Congress had already demonstrated, without any prodding from the administration, that it was prepared to act on most of the issues included in the administration's package. In fact, administration witnesses were chided in congressional hearings this spring for not being prepared to take a position on already pending legislative initiatives. Regardless of who is taking the lead on immigration reform legislation, it is significant that the administration has now clearly signaled its intention to advocate a reform effort of this nature. That fact will enhance the prospect for the Congress to enact legislation this year and have it signed into law. The nature of the Congressional reaction to the immigration reform package can only be speculated on at this point. Although the administration has prepared draft legislation, which it outlined in the July 27 press conference, that proposal has not yet been introduced in the Congress, and some further modification is possible as the administration lines up sponsorship. Nevertheless, it is possible to compare the general nature of the proposed legislation with the bills already submitted by various members of Congress. The Congressional agenda for immigration reform on the issue of asylum abuse had been set by three bills introduced in the House and one in the Senate. These measures are as follow. Representative Bill McCollum (R-FL) sponsored the "Exclusion and Asylum Reform Amendments" (H.R. 1355) designed to strengthen U.S. border enforcement by providing for the exclusion of undocumented and falsely documented aliens, and expeditious consideration of asylum claims. Representative Charles Schumer (D-NY) proposed the "Immigration Pre-inspection Act" (H.R. 1153) which would extend the current trial system of pre-inspection to an additional three ports of embarkation to the United States to screen out more would-be fraudulent asylum applicants before they arrive in the United States. Representative Romano Mazzoli (D-KY) sponsored the " Asylum Reform Act" (H.R.1679) which would tighten up the standard for establishing asylum status and provide a system of control and timely adjudication of claims to this status. The alien would have recourse to one appeal on the merits of the claim. Senator Alan Simpson (R-WY) introduced a "Port of Entry Inspections Improvement Act" (S. 667) which addressed the need for enhanced exclusion proceedings against undocumented and falsely documented aliens at ports of entry in provisions similar to the McCollum bill. Hearings were held on this bill in the Senate on May 28. The difference between the McCollum and Simpson "summary exclusion" approaches to correcting the problem of asylum abuse is that the House version also applies exclusion provisions to aliens who enter the United States illegally by circumventing ports of entry. The Senate version does not. Hearings on the three House bills took place on April 27. Testimony presented at the hearings and statements for the record noted that the provisions in the bills were not mutually exclusive. And, in fact the sponsors merged their approaches into a new bill (H.R. 2602 — the "Immigration Enforcement and Asylum Reform Act of 1993") introduced on July 2 by Congressman Mazzoli. The subjects dealt with in this new, omnibus bill will sound very familiar to those who first learned about the reform initiative from the White House announcement later in the month. The issues it covers are streamlined exclusion provisions for undocumented and fraudulently documented asylum applicants at ports of entry, stiffer penalties for alien smuggling, sanctions against asylum applicants who fail to appear for hearings, increased pre-inspection operations at foreign airports, enhanced electronic processing of data on arriving aliens, expansion of the visa waiver system for visitors from certain countries, and training for airline personnel in detection of fraudulent documents. The omnibus bill, like the administration proposal, would increase funding for the Border Patrol and the INS's anti-smuggling unit and double the size of the asylum officer corps. The provisions for excluding aliens who request asylum call for screening by an INS asylum officer, whose decision to exclude the alien would be subject to review by another asylum officer (presumably a supervisory officer) at the port of entry .Judicial jurisdiction in asylum exclusion cases would be limited to habeas corpus verification of the alien's citizenship and processing under the exclusion law. Despite the similarities between the administration's "expedited exclusion" approach and the provisions in the omnibus House bill and Senator Simpson's Senate bill, there are some significant differences. The Simpson bill, like the earlier McCollum bill in the House, provides for "summary exclusion" of fraudulent asylum seekers. The procedures that would be established by those two pieces of legislation allow for the exclusion of persons not properly documented for entry into the United States, even if asylum is requested, if an asylum officer, after hearing the basis for the request, decides the alien has not established that it is "more probable than not " that the statements about having a well-founded fear of persecution if returned to the home country are true. The second Mazzoli bill (H.R.2602) also includes this "more probable than not" standard for determinations by an asylum officer at the port of entry. This provision results in a higher standard of proof for the alien than the one proposed by the administration. The standard the asylum applicant must meet to obtain asylum status under the administration's legislative proposal is that there be "a substantial likelihood" that the applicant would be in danger of persecution if returned to his or her country. The administration's fact sheet explaining the legislative proposal states: "For the purpose of the credible fear determination, the 'substantial likelihood' standard does not require a showing that the assertion or outcome in question is more probable than not to be true or to occur." Different provisions related to the test the asylum applicant must pass to be granted asylum appear in the latest Mazzoli bill for those aliens who already have been paroled by an asylum officer into the United States. During asylum hearings the alien, who may be, represented by counsel, will be granted asylum if he or she establishes that it is "more likely than not" that persecution would occur if returned to the home country. Discretionary authority is also provided to the Attorney General to grant asylum if the alien establishes a "good reason to fear" persecution if returned to the home country. It remains to be seen if these different tests in the bills become contentious. Another significant difference between the approaches concerns the difference between "summary exclusion" and "expedited exclusion." The current Mazzoli bill is not a summary exclusion bill, as was the McCollum bill, because it provides for appeal and review of an exclusion decision made by an asylum officer. However, the review is provided by another asylum officer at the port of entry. There is no reason that the entire process of hearing and review of the exclusion claim could not be completed in hours rather than days or months (like the current process). The administration proposal, on the other hand, provides for review by another official outside of the Immigration and Naturalization Service. It would seem to almost assure greater delay if the review process involved an official not based at the port of entry. This issue may become a sticking point because it is central to whether the process is likely to move quickly enough that backlogs don't continue to create the need to parole asylum applicants into the country pending hearings. A related difference that also may impinge on the speed of the process involves the provision in the administration's proposal to allow the excludable alien "to consult with a person or persons of his or her choosing prior to the credible fear determination process or any review thereof....Such consultation shall be at no expense to the Government and shall not delay the process." This provision is not in the Senate version or in the most recent House provisions for port of entry screening. It is difficult to imagine how a consultation process would not cause delays. Key actors in the asylum reform process besides those identified above will be Senators Ted Kennedy and Dianne Feinstein. Senator Kennedy circulated draft legislation prior to the Senate hearings on Senator Simpson's bill, but he never introduced it. He is likely to be the sponsor of the administration's bill. However, the administration draft is much closer to the Simpson and Mazzoli approaches than to the earlier Kennedy effort. Senator Feinstein, because of her outspoken public involvement in calling for reform of the provisions for controlling illegal immigration, has also staked out a position of influence in the debate. Both of these liberal legislators are also likely targets for lobbying efforts by groups that are opposed to any changes that would affect the status of aliens already in the United States, whether legally or illegally. "[The initiatives are a] step in the right direction [but] limited in scope. Something has to be done. The system is seriously broken and has to be fixed." "[These initiatives] do nothing to reduce the easy availability of government benefits that attract so many illegal aliens and do nothing to protect American jobs being taken by illegal aliens." The earlier congressional legislative initiatives and the just-announced contribution of the administration have touched off a round of congratulatory statements from the growing numbers of persons and organizations concerned about illegal immigration. They have also touched off a round of criticism from alien rights organizations. Criticism has also arisen from some Republicans and other groups that the administration's proposals are very limited in scope and do not address fundamental problems. The focus in the media has concentrated on the issue of asylum abuse, as if solving it would be a panacea to the nation's immigration problems. Senator Simpson, like Representatives Mazzoli and Smith cited above, was quoted as saying about the asylum and illegal entry reform package, "There is much more to do." What is there on the agenda besides the issues announced by the administration? There are several additional pieces of legislation that have been introduced into the current Congress. Some of the issues are controversial and are likely to meet major opposition. One of those issues concerns the constitutional provision that confers U.S. citizenship on all persons born in the United States. Congressman Anthony Beilenson (D-CA) has introduced a joint resolution (H.J.Res. 117) calling for a constitutional amendment to limit citizenship at birth for persons born in the United States to those born to a U.S. citizen or legal resident mother or father. Senator Simpson appeared to be supporting this provision when he told the Washington Times, "We are the only industrialized country that grants automatic citizenship to anyone born here, including the child of an illegal alien...Do we continue to do that?" Although increased resources for the Border Patrol clearly is needed to improve border control operations, that addresses only one aspect of the problem. Another area requiring action is the adoption of a secure national worker identification system tied to the social security system. This is a proposal that has been introduced in the House (H.R.1079) by Representative Elton Gallegly (R-CA) and is reportedly being readied for submission in the Senate by Senator Simpson. Hearings have already been held in the House, and Representative Mazzoli, who chaired the hearings, has publicly commented favorably on the concept. A secure worker identification system that made it more difficult for an illegal alien to find employment in the United States would diminish the attractiveness of illegal entry both for those who now evade the Border Patrol and for the visa status violators who enter legally and then seek to remain in the country .The INS estimates that over 55 percent of the new illegal alien settlers in the United States each year are these overstayers. The immigration reform effort will remain incomplete if it does not include an overall rethinking of the size of legal immigration. With legal immigration having been increased in the 1990 immigration legislation to permit an expansion of admissions by an additional 40 percent, it is fair game to call for a review of whether that decision was in the nation's long-term interest. The issue is made more acute by the fact that, even as the 1990 law was adopted, the economy entered a slump and unemployment soared. It would make sense that the level of new immigration be related to the capacity of the United States to absorb new immigrants. This is an approach recognized by other immigrant receiving countries, but it is not a feature of the current U.S. law. Even if the economy were healthy, however, the newly revised Census Bureau population projection released in December 1992 has caused some environmentalists, other social scientists and concerned members of the public to call for a rethinking of the overall immigrant admission policy. That projection indicated that the country is now on a trajectory of never-ending rapid population growth due in large part to higher levels of immigration. These latter issues are not addressed in the Clinton administration's announced reform package. However, as indicated by Vice President Gore, the immigration reform task force he is heading has not yet completed its work. It is continuing to work on long-term immigration issues. Regardless of whether the administration decides to encompass any of these related reform proposals in its agenda, it is clear that they will be introduced and pursued in Congress because of the growing concerns of the American public.